Dining out on Valentine’s Day is something that makes me feel damned if I do, and damned if I don’t. I know that the crowds can adversely affect the quality of the food. Yet I also know that if my husband and I stay home, I’ll just end up wishing we were out. Damn. In the end, Valentine’s Day this year warrants not one but two meals out. 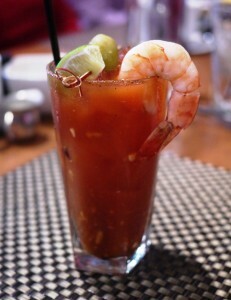 First up is Sunday brunch at GrillMarX Steakhouse & Raw Bar in Olney. I am with a large group who get together annually to celebrate the big V Day, but never on the actual day. The decision to go to GrillMarX appeals to me. I haven’t been yet, and it’s on the list. There is a $20 per person brunch buffet. While I view this as a good deal, ultimately my husband and I decide to order off the menu. We’re just not feeling the buffet. 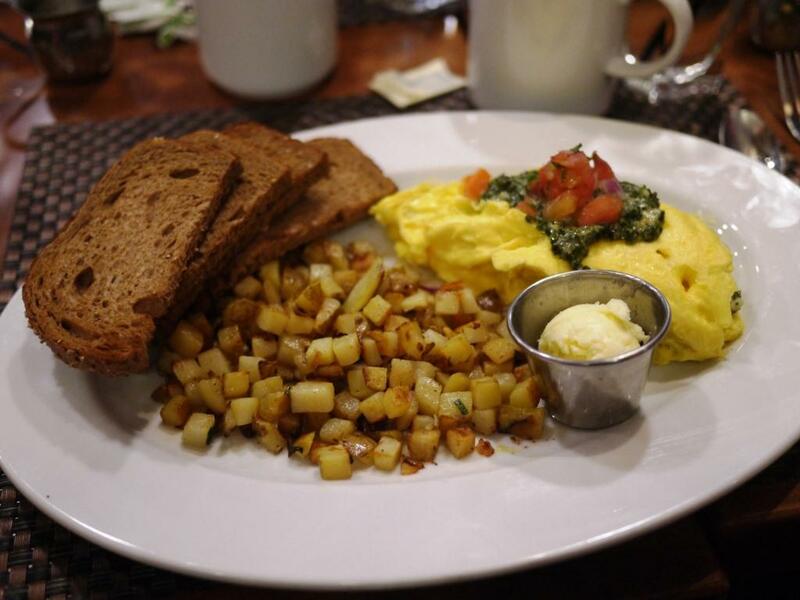 Instead, we share a spinach omelette and French toast bread pudding, which both have a little more pizzazz. The eggs are nice and fluffy, although I would appreciate more spinach and a little less egg. 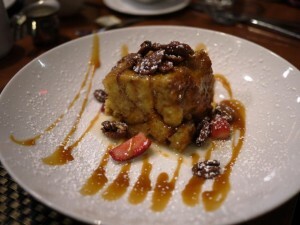 The bread pudding is a generous serving, although I find it a bit heavy. A few bites are perfect, but more than that gets tiresome. The presentation, however, is quite appealing. If I am looking for love here, I would say it can be found in the prime rib (I sneak a bite off of my friend’s plate from the buffet), and in a first class Bloody Mary with homemade horseradish and rimmed with Old Bay spice. GrillMarX is all about its hickory wood burning grill, so I’m not going to judge it based on eggs and french toast. The bite of prime rib is enough to whet my appetite. I’ll come back for dinner. Hopefully soon. The real Valentine’s Day dinner has been a challenge in terms of deciding where to go. I tell my husband that I don’t want anything fancy and I don’t want to go downtown. I leave the rest to him. This is not an easy thing for me to do. When he suggests Lebanese Taverna in Bethesda, where they have a dinner special featuring unlimited mezze, I am tempted to say no because I really was thinking about something much more casual. I’m also wondering about the quality compared to a regular night of made-to-order dishes. But then I remember I’ve left this up to him. I am proud of myself for actually giving up the control. I’m actually happy to see that Lebanese Taverna is packed, even though it may mean longer waits for food. But the crowds serve to validate our decision, which I know is contradictory to my original fear of Valentine’s Day crowds. (go figure) The server tells us that we can order as many items as we want from a list of 30 choices. We can have seconds on any of the options. The only stipulation is that we are asked to only order a few at a time, so as not to overwhelm the kitchen. We enjoy bread dipped in zatar while we await our appetizers: baba ghannouge (their spelling not mine), grape leaves, and fattoush peasant salad. It’s a solid beginning. We go our separate ways on the hot mezze. I have shrimp arak and lamb/beef flatbread, while my husband has cheese pies and salmon. 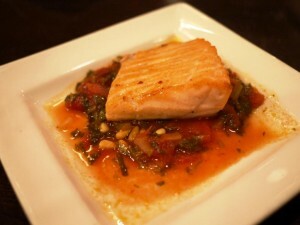 He raves about the salmon, which is topped with grilled vegetables, tomato, cilantro, and pine nut sauce. We share herb fries, which are too soggy for me to enjoy. I’m not over the moon about any of my dishes, but at the same time I’m perfectly content. 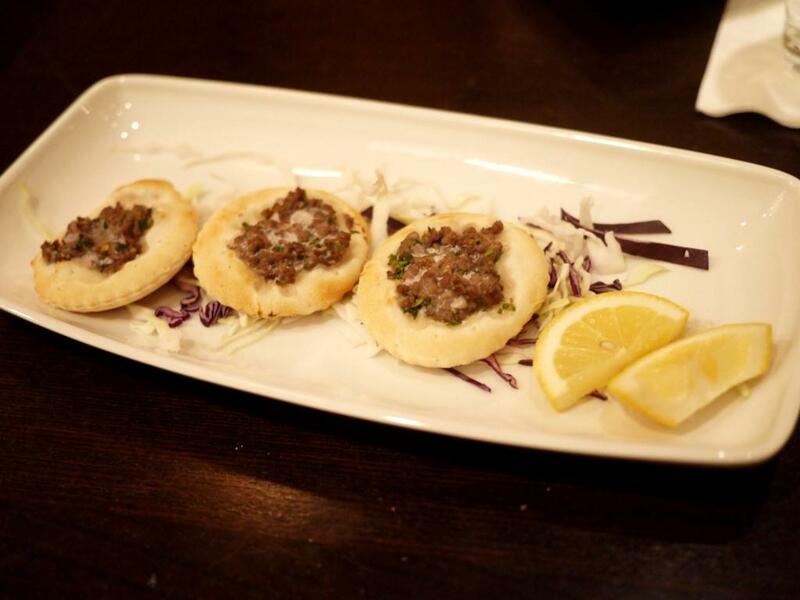 While we are welcome to try more dishes, we’re stuffed. The dinner deal includes one dessert for each of us, so we can’t pass that up. I have fried donuts, which may have been good had they been served to me a few minutes sooner. My husband’s molten chocolate cake isn’t particularly remarkable. This is one of those meals where the whole is greater than the sum of its parts. This is my third visit to Lebanese Taverna and I know it won’t be my last. 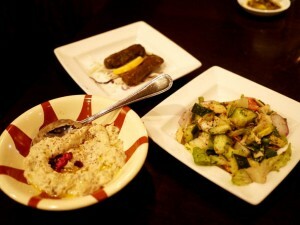 I am sure that the unlimited mezze is a challenge to the kitchen and wait staff, but as a diner it suits the occasion. My expectations are more than met. While I am not exactly raving about either of my Valentine’s Day meals, I am not complaining either. Sometimes the food doesn’t have to be spectacular. It can also be about having a love-ly meal with a loved one.